Three new clients have recently launched their repositories on the Atmire Open Repository platform. 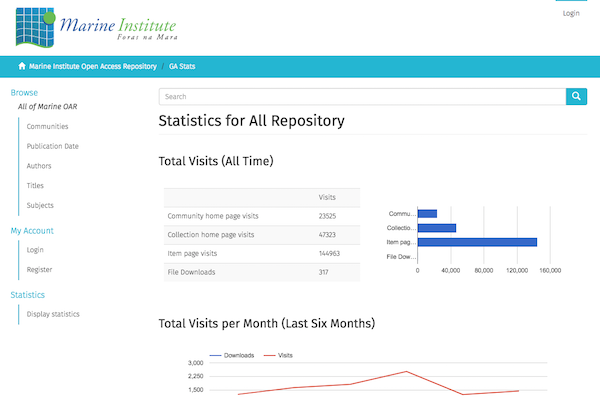 Atmire is proud to host and service three new repositories. With the data imports and the configuration activities completed, we invite you to discover them. For Teagasc, the Irish Agriculture and Food Development Authority and the Marine institute, DSpace based institutional repositories have been in service for many years. In order to benefit from the features of a more modern DSpace, as well as the Open Repository specific functionality, both institutions decided to embark on an Open Repository migration last November. Because Atmire logs in directly to the old servers as part of the migration, all of the repository contents, including the resolution of the existing handle.net permalinks were retained throughout the migration. 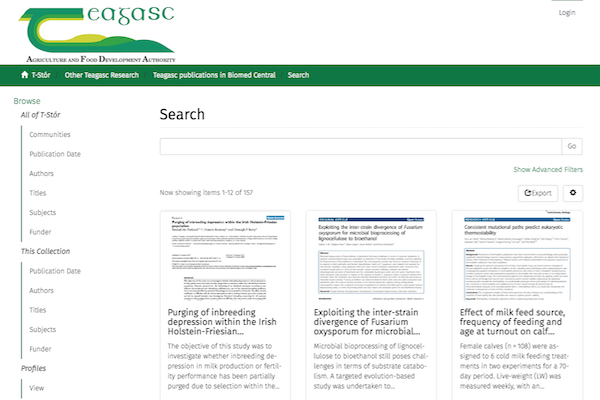 This is screenshot of the Open Repository search results page for Teagasc, where users can switch between the normal DSpace list view, and the Open Repository grid view. As both institutions have been relying on Google Analytics for tracking repository usage, continuity was assured there as well. In addition to the standard DSpace functionality, Open Repository adds support for tracking file downloads and offering visualisation of the Google Analytics data, on a dedicated page of the repository. For Vlerick Business School, the only Belgian institute that holds the three major business school accreditations AACSB, AMBA and EQUIS, Atmire established its first ever institutional repository. Leveraging metadata from an internal Vlerick database, the Vlerick staff only needed limited guidance to execute the data migration and imports, thanks to the Open Repository batch import tools. With the corpus of metadata now ingested and a brand new metadata profile established, the team is acquiring more full text from faculty so the repository can truly fulfill open access goals instead of merely acting as a bibliographic record. The Atmire team is working relentlessly on migrations and upgrades for new and current clients. Stay tuned for more exciting releases! 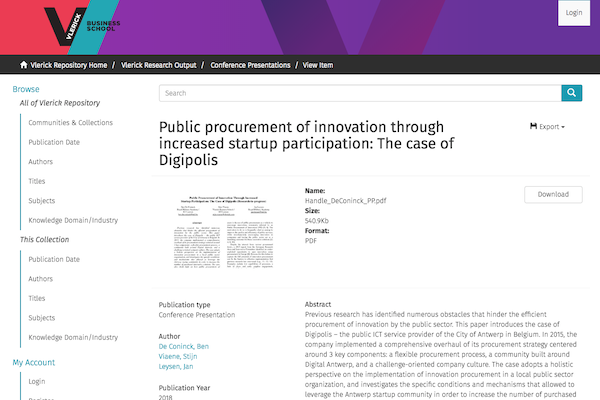 Our team is happy to give you more information about these projects or the featureset and pricing of Open Repository. Contact us today.